The history of the Sesto Mountain Guides began in 1869 with the first climb of Cima Grande by Franz Innerkofler and his guest Paul Grohmann. In the course of the following years all main peaks of the Sesto Dolomites were conquered by local Guides accompanied by paying guests. And so the “King of the Dolomites”, Michl Innerkofler, mastered many courageous first climbs, such as the normal route up Cima Piccola, that had been considered to be impossible until then. 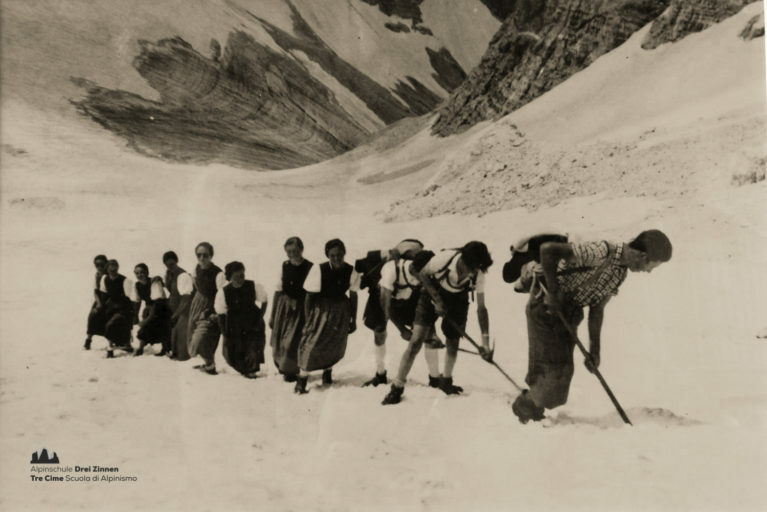 Another outstanding personality at the turn of the century was Sepp Innerkofler, who developed several new climbing routes and, in addition to his work as a Mountain Guide and Alpine hut owner, was also a pioneer in tourism in Sesto. His death on Monte Paterno at the beginning of the First World War was a sad moment for many admirers. During the wars tourism in Sesto decreased. When more visitors returned to Sesto after WWII, a new generation of Mountain Guides got together and resumed working in the mountains. Soon, the group from Sesto was once again well-known beyond the Dolomites. At the end of the millennium there were two mountain guiding schools in the valley and several Guides offering individual tours. To improve collaboration and to be able to offer visitors a comprehensive programme, Herbert Summerer was instrumental in re-opening the Alpine School Tre Cime in the spring of 2012. Since that time, all Sesto mountain guides have been working through the school. The new generation in the Alpine school is a team of friends who also spend their free time together in the Dolomites and in mountains all over the world. All Mountain Guides are also members of the mountain rescue service. 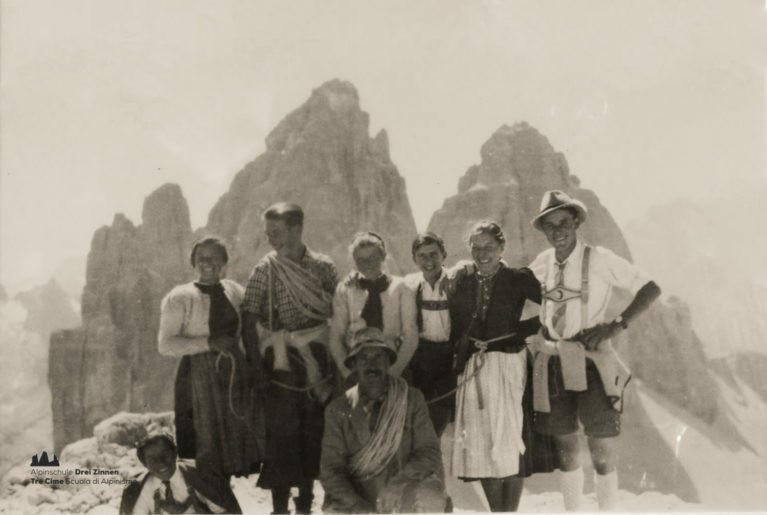 The mountain guide Benitius Rogger with a group on the summit of the Monte Paterno, late 30s. On the way to the summit of the Monte Popera, late 30s. At that time still glacier area.